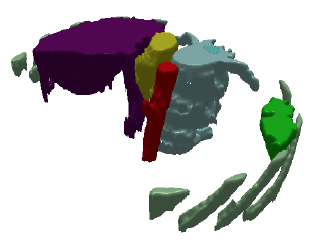 millipede is the software tool I developed to accompany my DPhil thesis on 3D abdominal CT image segmentation. This thesis focuses on how to allow a computer to identify features (such as major organs) in abdominal computerised tomography (CT) scans in an automatic way, whilst still facilitating user interaction with the results. Identifying such features is important if they are to be visualised in 3D for the purposes of diagnosis or surgical planning, or if their volumes are to be calculated when assessing a patient’s response to therapy, but manual identification is time-consuming and error-prone. Some degree of computerised automation is therefore highly desirable, and indeed a small number of existing approaches have even attempted to fully automate the simultaneous identification of multiple abdominal organs. However, no existing method is capable of achieving results that are completely accurate in all cases, and due to the difficulties even of specifying when a result is correct, the development of such a method seems unlikely in the near future. It is thus important that medics retain the ability to correct the results when automated methods fail. My research proposes a way of facilitating both automatic feature identification and intuitive editing of the results by representing CT images as a hierarchy of partitions, or image partition forest (IPF). This data structure has appeared extensively in existing literature, but its potential uses for editing have hitherto received little attention. This thesis shows how it can be used for this purpose, by presenting a systematic set of algorithms that allow the user to modify the IPF, and select and identify features therein, via an intuitive graphical user interface. It further shows how such an IPF can be initially constructed from a set of CT images using morphological techniques, before presenting a series of novel methods for automatic feature identification in both 2D axial CT slices and 3D CT volumes. All of the techniques described have been implemented in one of two systems developed to illustrate their effectiveness. The trial system, centipede, works on 2D slices, whilst the final system, millipede, works on both 2D slices and 3D volumes. Validation tools were implemented in millipede to allow the feature identification methods to be evaluated against ‘gold standard’ manual results produced in collaboration with a radiologist, and the results are presented herein.